Constructed from 3/4" polyester webbing with UV protection. This unique hanger allows you to adjust your fender height from 6" to 24". 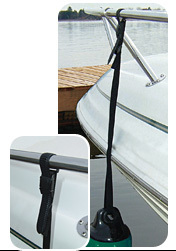 Simply loop the strap over any size rail or lifeline, feed the end of the strap through fender eye or tube and pull strap through buckle to desired length. Slide tab into release buckle until you reach the tightness around your rail or lifeline that you desire.